? DARAZ: YOUR ONLINE SHOPPING APP - Use code &lsquo;ILOVEAPP&rsquo; to get Rs. 500 OFF! ? Payment on delivery with safe &amp; secure payments ?? Purchase protection with 100% genuine products and free and easy returns ?? Largest selection at the best prices ?? Download the Daraz App and use voucher code &lsquo;ILOVEAPP&rsquo; to get Rs. 500 off on your first purchase! 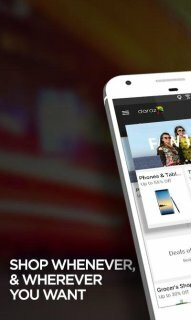 "Daraz.pk&rsquo;s user-friendly mobile app, is perfect for customers on the go"
?Exclusive Offers &amp; Daily Deals Notifications on Mobile App. ?? View high quality product images and read detailed product descriptions &amp; reviews from previous customers. ?? Still not sure? No problem, simply add the product to your wish list. Once you are, come back, add it to your cart and continue your online shopping. ?? Easy payment options that offer fast and secure online shopping. Choose between VISA / MasterCard, bank transfer or simply cash on delivery. Top Android operated brands like Samsung, Qmobile, Huawei, Infinix, Mi etc and IOS operated iPhone 6, 6s and 7 including mobile accessories. Online shopping for breakfast items, canned products, beverages, snacks, laundry and home care products. Other categories include beauty &amp; health, home &amp; living, sports &amp; travel, baby toys &amp; kids, books, stationery, lifestyle accessories, automotive and motorcycles, equipment and tickets &amp; vouchers.